This past year, news outlets have exposed the act of “lunch shaming” in school districts across the nation. Stories of shaming kids for not being able to pay for lunch have been featured in several states including Alabama, Pennsylvania, New Mexico, and Texas. While there is a need for a solution for lunch program debts, punishing the child is not the answer. In many situations where there is an accumulated debt there is a need for investigation as to why a student may have an outstanding balance. Some of these reasons include a lack of awareness of the low income eligibility and application requirements, temporary living arrangements, involvement in the foster care system, and changes in a family’s income. Most often the students affected by these shaming acts are those who are already marginalized and stigmatized by their peers. Additionally, new controversial immigration enforcement acts have caused many mixed status immigrant families to decline enrollment for the reduced lunch program even if they are eligible to do so. The spotlight on this issue has created an emotional narrative for readers across the country and even sparked action from many private citizens who can’t stand the thought of a child being denied a meal. In Mississippi, New York, Delaware, and Indiana donors have paid for the debts of entire school districts. Advocates have also used Twitter to spread the message and have raised hundreds of thousands of dollars to pay for school lunch debts across the nation. While it is encouraging to see such action being taken on this issue, there is still a need for clear policies to ensure that children are safeguarded from carrying this financial burden. New Mexico was among the first in action by signing into law The Hunger Free Students’ Bill of Rights Act. The bill requires that schools provide all students with a meal regardless of money owed. Pennsylvania has drafted similar legislation. Senate Bill 709, prohibits schools from humiliating children if their guardians/caregivers owe the school lunch money and requires the district to find a way to work with families who may need assistance. 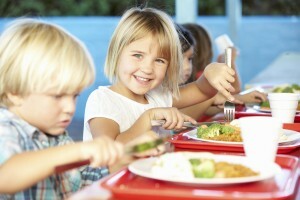 On a federal level, The Anti-lunch Shaming Act was introduced in both the House and Senate with bipartisan support. This bill bans schools from stigmatizing children whose parents cannot afford to pay for their school lunches. It also requires schools to direct communications about unpaid school lunch bills to the parent, rather than penalizing the child. First Focus Campaign for Children has endorsed this legislation. A child’s nutrition is directly related to better school performance and early childhood development. According to Dr. Tanya Altmann, a pediatrician and spokeswoman for the American Academy of Pediatrics, children get a third to half of their daily calories at school. After the release of the President’s 2018 budget request, which includes deep cuts to Medicaid, Children’s Health Insurance Program, and the Supplemental Nutrition Assistance Program, there is no doubt that the well-being of our children is at stake. We need more leaders, who understand the importance of investing in children, to support policies that will protect our children and ensure they are receiving the nutrition they need to give them a brighter future. To take action to protect investments in children in our federal budget, click here. To learn more about child nutrition programs in the president’s FY18 budget proposal, click here. Learn more from the USDA best practice resource and policy guidance for Unpaid Meal Charges.